This does work although as you would be aware its an “all or nothing approach“. Why it just isn’t included as an option in settings seems crazy to me, especially considering how many people seem to be asking for it. And please don’t advise me to add it as a feature request like so many others have been told – I’m sure if your managers just read some of your customer feedback you would know its a pain point and it you shouldn’t make someone have to go through writing a business case for you… Anyway, I digress. That still doesn’t really resolve my issue. I want to hide the remaining tickets until it reaches a low threshold (e.g. say 5 tickets remaining) which at that point it will display text like “Hurry! Only a few tickets remaining” or words to that effect. 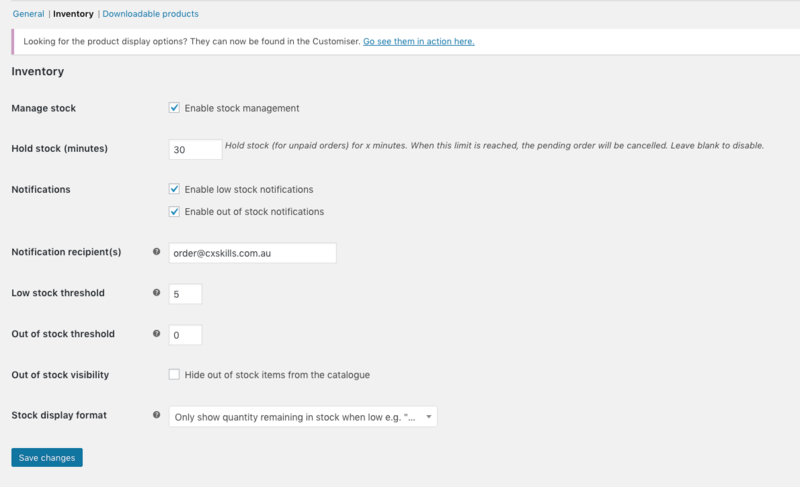 It seems to me that that functionality exists within WooCommerce as you will see in the attached screenshot. Isn’t your product supposed to integrate with WooCommerce so I would have thought the options here can be used but it would appear as though they have no bearing on the front end (on my website anyway). So I guess the question is how can I achieve that result using your product? Am I doing something wrong or is it a limitation of your product? Yeah, that option exists in WooCommerce, and has an effect on the WooCommerce product pages. However we don’t use those pages to show the tickets. Nonetheless, what you want should be possible with a template override. Line 145 is the one that prints out the availability. You could surround that with an ‘if’ check and check if the ‘$readable_amount’ is above / below the value the need, and then output the required text.